Ever need a quick and easy way to tell your clients about proper watering? What about promoting and explaining beneficial seasonal services like aeration? 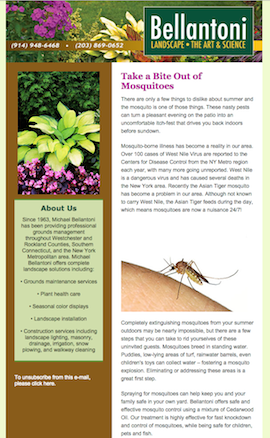 Our E-Newsletters are the perfect way to keep your clients informed while directing more traffic to your website. With this new service, content from our extensive archive is now available in an e-mailable format. We start by working with you to develop a newsletter schedule for the year. Most of our clients opt for monthly newsletters, and we make the process easy enough that this frequency is not difficult to manage. Below are 3 different "editorial calendars" that you can pick and choose articles from. These are just ideas, you can provide us with your own content or request other topics from our archive. Once the schedule is settled, we customize an html template for you, create a custom masthead and set up an online account for you at growpro.createsend.com. Then we will set up a newsletter preview and e-mail it to you. We'll take any revisions you want to make prior to distributing it to your e-mail list. Once the campaign is sent, you can log in to your online account to track the number of people who open your campaign and click through to your website. 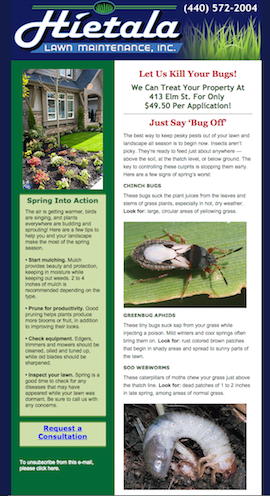 Below are topic ideas for Lawn Care, Maintenance, Commercial and Landscaping E-Newsletters that correspond to articles already in our library. Look these over and then cut and paste the topics you'd like into the form below. You can also fill in with your own topic ideas if you have ideas that aren't listed here. Once we receive your submission, we'll contact you to firm up the details and your e-newsletter program will be scheduled. December: Thanks For A Great Year! 1) Initial Setup: Includes the design of your custom masthead, customizing the template colors and creating your account at growpro.createsend.com. 2) Per-Campaign Charges: Includes the setup, proofing and distribution of your E-Newsletter campaign to up to 1,000 e-mail addresses. Prices are determined based on how many issues/campaigns we produce for you. Cost: 12 e-newsletters per year: $205 per campaign. 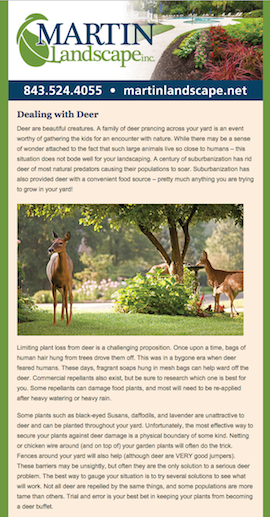 6 e-newsletters per year: $255 per campaign. 4 e-newsletters per year: $295 per campaign. 3) Additional E-Mail Addresses: The above charges include up to 1,000 e-mail addresses. Additional e-mails cost $0.015/address. 4) Custom Copywriting: The above charges include use of our pre-written articles and/or light editing of content you provide. 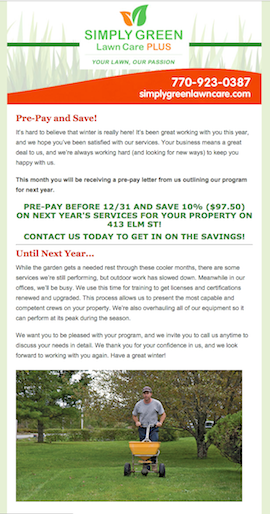 If you require custom copywriting for a given newsletter, there will be a $75 charge added to that issue.